A candidate for legislative office openly mocked this organization as well as the members who support us. You have a chance to help us fight back — more on that in just a second. We are now eight days away from the primary elections and campaigns are feeling the pressure. Candidates who feel they are losing are getting desperate. The blood, sweat, and tears that many candidates have put into their campaign are coming to an end. When that happens, candidates get irritated and some can lose their ability to think logically. Perhaps that’s what happened when one candidate was asked about the Idaho Second Amendment Alliance. Apparently, the 10’s of thousands of gun owners who support, and are members of our group, are meaningless to Mr. Evans? And he continued with that sentiment by ridiculing us for raising money to fight these political battles. You know, battles such as passing Constitutional Carry! Or does he give that criticism exclusively to us? Does Mr. Evans realize that without groups like the ISAA, GOA, and NRA, that gun grabbers would be raining down hellfire on us right now? The reality is that Mr. Evans is in panic mode. And mocking Idaho’s largest and hardest hitting grassroots gun rights group isn’t the way to win over voters. In fact, the ISAA is planning a trip to Mr. Evan’s district this week! We intend to inform voters not only of his unwillingness to fill out our survey, but to also inform his voters that he doesn’t seem to care about this organization and the members who support us. In order for us to do that, we need your IMMEDIATE help! Our goal is to print off thousands of flyers to distribute all around Mr. Evan’s district. But because we are within 30 days of the election, Idaho’s law requires us to disclose donations for these flyers to the Secretary of State’s office. If that’s okay with you, then we are asking you to step up and proudly donate to the Idaho Second Amendment Alliance today by chipping in $25, $10, or even just $5 TODAY to get these flyers printed. Our goal is $300 and we know you guys will step up again! 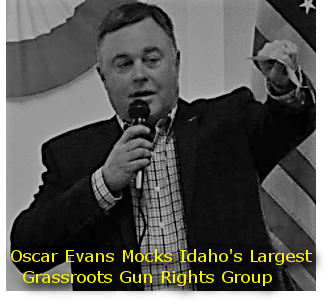 After you have donated, please contact Mr. Evans and tell him to fill out our survey, and apologize to gun owners in Idaho for his remarks. Be respectful but firm in your request. The election is almost here and this crucial info needs to be distributed this week!